Building a community of philanthropists and creating a legacy to promote growth and positive change in children, youth and families. Your donation directly supports the community and area. We value your partnership with us to ensure that children and youth are empowered to achieve success in life and, in turn, are enabled to contribute back to their own community. All donations over $15 will be issued a tax receipt. For ONLINE donations: Please scroll down The Winnipeg Foundation page and at the bottom of the page click “Search for a Fund” and enter The Steinbach Community Foundation. The Steinbach Community Foundation name will appear on the right of the page. Click DONATE, you must choose “Make this donation in honour, memory or in celebration of someone”. Then please add: “In honour of The Chrysalis Fund”. Donations by cheque: Please make cheques out to The Steinbach Community Foundation” and in the memo line include “The Chrysalis Fund”. The Chrysalis Fund is a new trend in philanthropy in which a community of women philanthropists are strategically pooling their resources and leveraging them to impact specific causes and interest areas in the community. The Chrysalis Fund was started by a group of 11 women and is governed by an Advisory Board selected from its donors. The Advisory Board is responsible for The Chrysalis Fund’s management and operations. The officers and committee chairpersons are selected from within the board. The Chrysalis Fund is strategic in its grant making and program support. It identifies issues to address and invests grant dollars in projects and programs for maximum impact. Decisions regarding grants are made by all members of the fund. Each member is entitled to one vote on all matters concerning the governance, funding guidelines and grant-making decisions. The goals of The Chrysalis Fund are to encourage healthy development of children and youth, to increase the life skills of children and youth and to provide opportunities for children and youth to learn, grow and to give back to society. Additional goals include creating a legacy in the form of an endowment fund and expanding philanthropy and giving by women in our community and surrounding area. 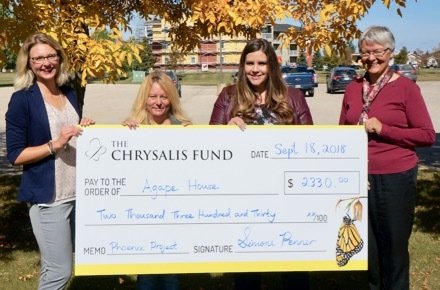 The Chrysalis Fund is an endowed fund held with The Steinbach Community Foundation, and as such operates according to its policies and procedures. Within this structure, a donor’s gift to the endowment is permanently invested to ensure that there will be money in perpetuity to fund charitable programs that benefit children and youth. The Steinbach Community Foundation manages The Chrysalis Fund’s invested dollars. Only the interest as per the Foundation’s spending policy is used to make grants. This way, the fund is able to support the community forever. Agape House is a women's shelter providing a safe environment for women and children in times of crisis and domestic violence. They offer shelter, counselling and ongoing support to individuals and families going through these traumatic situations. To build on their pillar of ongoing support for women in their program, the $2330 received from this year's grant will go towards establishing the 'Phoenix Project'. The funds will be used to create a collection of resources and self-lead support groups for women who have experienced domestic violence and continue to work towards healing. Steinbach Community Outreach is a local organization working to meet essential needs of community members in Southeast Manitoba. This year the Chrysalis Fund was able to grant the organization $4670 to support the creation of self-care product kits for local families in need. As long as there is a need for these self-care products, Steinbach Community Outreach will be there to maintain the dignity of the clients it serves and encouragement for a bright future. The Chrysalis Fund Grant application deadline is April 1. 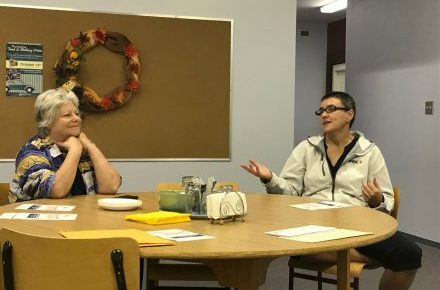 Moni Loewen and Irene Kroeker share stories with members of The Chrysalis Fund of the joys and challenges in working with families in this community. The collaborative nature of the non-profit organizations that work in Steinbach and area makes each of them stronger and more effective in addressing the gaps they identify. 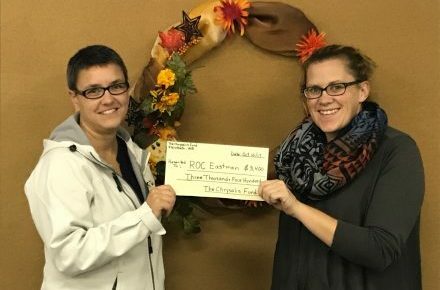 Moni Loewen from ROC Eastman received a $3400 grant from The Chrysalis Fund in October 2017. This grant goes towards supporting children who would like to participate in creative arts such as theatre, art classes, music, etc. 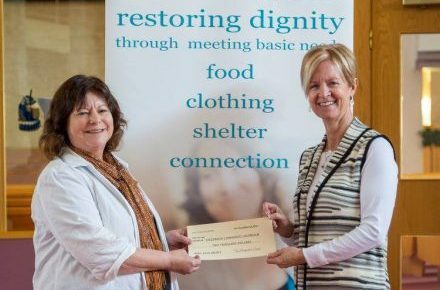 The cheque was presented by The Chrysalis Fund member, Sheila Krahn. Members of The Chrysalis Fund enjoyed a tour on October 10, 2017 of Steinbach Community Outreach's new facility. Irene Kroeker from SCO shared many stories of how they are able to engage with a variety of individuals and families in this community. This new facility will allow them to deliver more programming throughout the week. The Chrysalis Fund provided SCO with a grant of $3400 for a project that provides healthy snacks to preschoolers between the ages of 1-6. Snacks are delivered to the homes by volunteers who are able to build a trusting relationship with these families. Please join the members of The Chrysalis Fund at the Annual General Meeting. Date: September 12, 2017 Time: 7-9pm Location: Jake Epp Library, 255 Elmdale Street, Steinbach Come learn about The Chrysalis Fund and hear from 4 organizations that work to support children and youth in our community! Since inception in 2009, The Chrysalis Fund has granted annually to local not for profit community agencies that promote growth and positive change in children and youth, a collective total of $39,780.00. 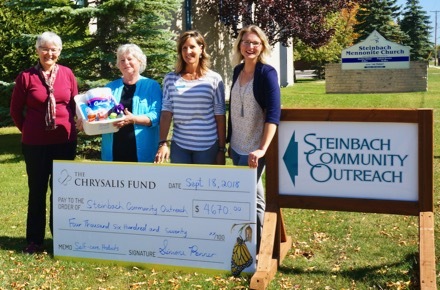 As The Chrysalis Fund continues to offer women the opportunity to team together to create a powerful legacy in the Steinbach community and area, we look forward to being able to continuously give back and expanding philanthropy. The Steinbach Family Resource Centre received a $4,728 grant in 2016 for their parenting course "Nobody's Perfect Parenting Program". "We knew there was a need in our community for a program but we didn't realize how deep the need was until we began advertising. Our first class has 6 parents. The most shocking statistic was that between these 6 people, 14 children had been apprehended by Child and Family services and they were desperately looking for how they could improve their parenting skills and get the children back". 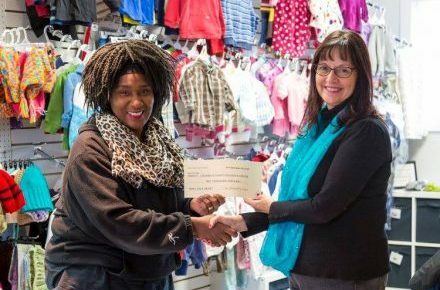 Vicki Olatundun from the Steinbach Family Resource Centre receives a $2478 grant from The Chrysalis Fund for a playground to educate young children on road safety. Presented by Marlene Klassen and Karen Loewen. Moni Loewen from ROC Eastman receives a $2,000 grant from The Chrysalis Fund presented by Sherril Reimer. The grant supported ROC to expand its services to include a leisure education program for each family. "Research has also demonstrated that by engaging children and youth in positive recreational endeavours, you decrease their risk of being criminally involved. ROC strives to provide each child with an experience that will increase their feelings of self-worth and self-efficacy, and to give the family the necessary tools to sustain the child's recreation pursuits beyond ROC" (ROC grant application). 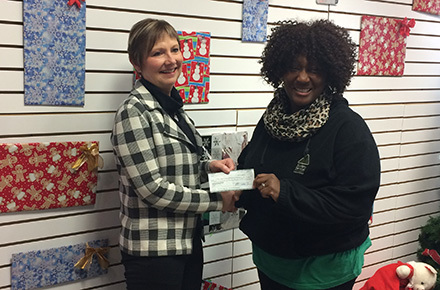 Vicki Olatundun from Steinbach Family Resource Centre receives a $2,000 grant from The Chrysalis Fund presented by Marcelle Fournier. The grant provided funds required for new flooring in the kitchen and play area as well as a few soft furnishings in the play area of the centre's new location. 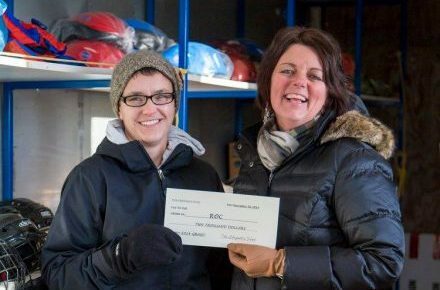 Irene Kroeker from Steinbach Community Outreach receives a $2,000 grant from The Chrysalis Fund presented by Shannon Kehler. 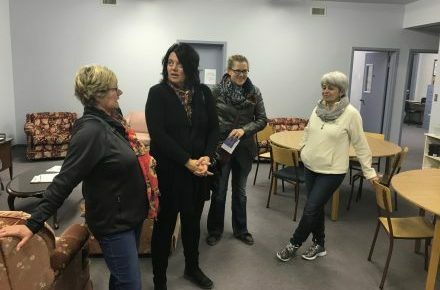 Steinbach Community Outreach (SCO) works to assist people in Steinbach that are struggling to meet basic needs, focusing their energy on those that are homeless or at risk of being homeless. In their grant application SCO stated that they "assist approximately 200 people per year that are homeless, and approximately 75 people per month that reach out to us by connecting with our volunteers in our Outreach room". The grant funding assisted SCO to provide a nutritious snack for pre-school children ages 2-4. In 2013 Eden East and Recovery of Hope received a $3,000 grant for a joint project that involved the presentation of a course in Steinbach entitled "Making Sense of Aggression". The course was based on Dr. Gordon Neufeld's attachment-based developmental paradigm. "The essence of the Making Sense of Aggression course puts parents and caregivers in touch with the attributes within a child that bring about maturity and responsibility. When parents understand how to draw these qualities out of children in the context of a safe and well-attached relationship, children will be more likely to grow generous hearts, having a desire to make a difference and help others." 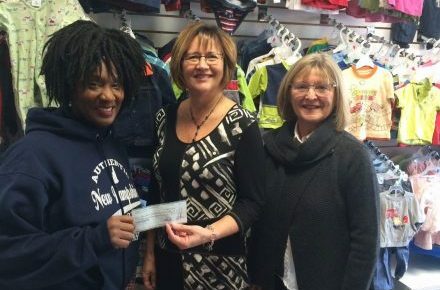 Jake Epp Library received a grant of $2,377 in 2013 for three programs that focused on youth. Program Coordinator Tracey Pankratz, developed a Youth Book Club, a Jewelry-making Class and a Star Gazer's Class that also included the purchase of a telescope. The goal of each program was to encourage reading and literacy in youth. "As a public institution and organization, we must do everything possible to be of value and interest to the patrons who frequent us." Jake Epp Library, grant application. Moni Loewen from Recreation Opportunities for Children Inc. receives a cheque from The Chrysalis Fund Members Pat Warkentin and Carmel Wiebe. This grant decision resulted in $6,600 being awarded to ROC Eastman. ROC Eastman is a not-for-profit organization working to support children and youth living in the Eastman Region of Manitoba, to connect to recreation and leisure opportunities. ROC Eastman began in 2009 as one of three pilot projects of Manitoba Family Services and Housing’s Job Connections Program, and has since been serving the needs of children and youth living in the Eastman Region, who experience barriers to participation in recreation. In 2011, The Chrysalis Fund was able to support Anna's House by providing funds to run their Teen Special Delivery Group. 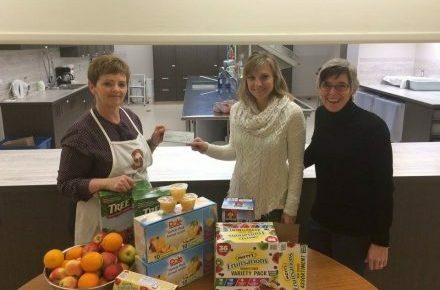 A $5,250 donation from the fund helped facilitate the Teen Group which covers all aspects of care for young moms-to-be and baby in a relevant, peer based group. The bi-weekly sessions give support throughout the pregnancy, thus fulfilling the mandate of the Chrysalis Fund. 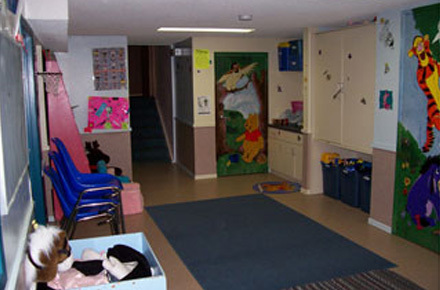 Anna's House is a family resource centre dedicated to helping families find support within and connection to the community. Each month over 300 families are served from a large range of socioeconomic and cultural communities. Youth for Christ was the recipient in 2010 of the grant monies distributed by The Chrysalis Fund. 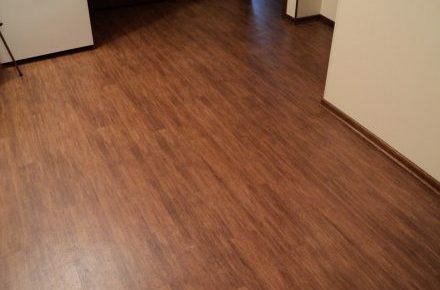 A $5,594 contribution was made to YFC with one half of this grant going towards the replacement of flooring in the basement of the U-Turn home on Fernwood Bay. 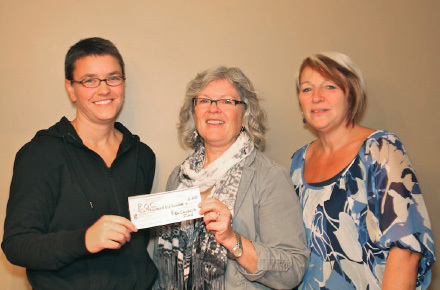 The other half of the grant money went to help facilitate the YFC supper club program. The U-Turn home was created to provide a program in which youth are mentored. There is space for up to four boarders, with house parents living on the main floor of the home and helping with day to day needs while YFC U-Turn coordinator Reuben Singh works with teens to achieve the goals of the program, namely to make positive changes in their lives. The YFC supper club program runs regularly on Wednesday night at the local drop-in centre. YFC is a worldwide Christian movement working with young people around the globe. Motivated by faith in Jesus Christ, the organization reaches young people in ways that are relevant to them in the context of their culture and life circumstances. Membership consists of a tax-deductible donation of $1000. This donation can be done in a manner that best suits the individual: as a one time gift of $1000, a pledge of $500 over two years, or 24 monthly donations of $41.67. The Steinbach Community Foundation and on the memo line please indicate: The Chrysalis Fund. 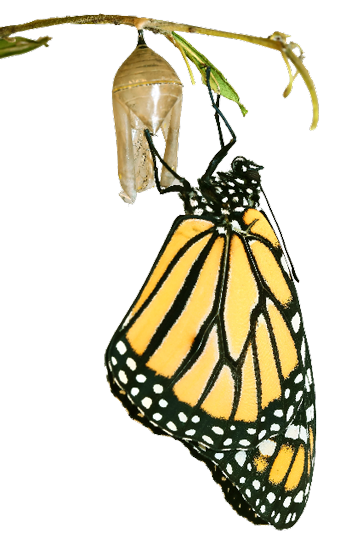 Individuals and/or corporations may donate to The Chrysalis Fund without a membership. In the past, some members have donated to the fund as a Christmas, birthday or graduation gift to others. 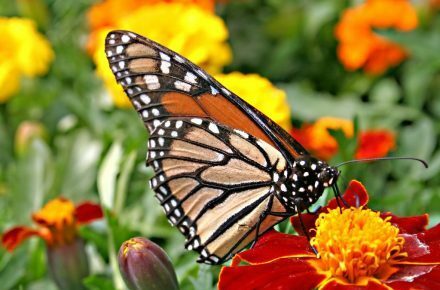 A donation to The Chrysalis Fund can be a unique yet personalized gift for an individual that also positively impacts their community. Click on the VIEW link below to download a PDF of our Annual Financial Statements. Debbie has been involved with The Chrysalis Fund from the time that it was just part of a conversation and an idea. 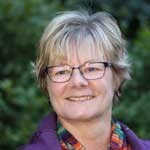 Having grown up in a home that valued being a contributing member of the community, Debbie has sought to continue that legacy through her work as a Palliative Care Nurse, as a founding member of a local preschool, as an advocate for a refugee family and through her involvement with The Chrysalis Fund. This women’s giving circle enables Debbie to further the vision of addressing community needs by linking existing resources and local organizations. Debbie also enjoys the synergy that develops when working with a group of women who are deeply committed to promoting positive change in the community. Debbie and her husband Curtis have lived in Steinbach for the past 30 years. They have three adult sons, one daughter-in-law and a proud grandmother of a precious little girl. Karen was born and raised in Steinbach. 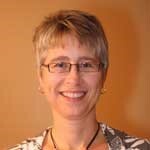 She attended the University of Manitoba and received her MD degree in 1994 and her certificate from the College of Family Physicians in 1996. 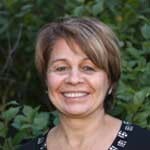 Karen has been practicing family medicine in Steinbach since September of 1996. 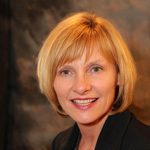 Karen’s work interests include obstetrics, cancer care and teaching medical students. Outside of medicine, Karen enjoys spending time with her family, swimming, biking, running, reading and travelling. Karen is married to Rod, mom to daughter Siobhan and son Liam. She is committed to the community and is thrilled to be a part of The Chrysalis Fund since its inception. Simone has had a passion for not-for-profit organizations for many years. She is immensely thankful that her passion has been fueled by the encouragement of her family. 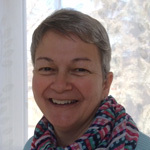 She is presently the chairperson of the homeless shelter in Steinbach, Today House and is part of the Refugee Committee at Grace Mennonite Church. She has been involved with the local soup kitchen, Soup’s On, the CancerCare volunteer program and the Palliative Care Program in Steinbach. Steinbach has been home to Simone for over 36 years. She has 5 grandchildren and if you ask her she will tell you, “Those are the best “volunteer days” when I have them all to myself, no parents around!” The biggest loves of her life are her husband, 3 sons, 3 daughters-in-law, 2 African daughters, and 5 grandchildren. Some other loves in her life are the friendships that have synergized over the years of volunteering in the not for profit world, reading, music (yeah for Spotify!). 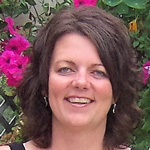 Brenda Penner was born, grew up in and raised her own family in the Steinbach area. Despite these deep roots in the community, her own family, travel opportunities and service on a variety of boards and committees have broadened her world view, especially to see the intrinsic value of all people, including any on the margins. Brenda is a wife, mother and grandmother. She has been employed in office, bookkeeping and administrative positions throughout her working years. 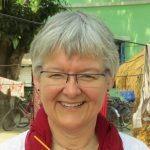 She has been an active church participant and volunteer in children’s and women’s programs, and committee work at local, provincial and national levels. She enjoys reading, word games, Sudoku, photography, traveling, cycling and life in general. Brenda considers it a real privilege to be able to be part of The Chrysalis Fund board and to be able to work together with the generous women who are involved in this practical way of giving back to the community. Steinbach has been home to Nettie for 36 years. After many very busy years of raising a family in the community and assisting in her husband’s business, Nettie is now retired, but continues to offer volunteer time. No longer involved in schools, sports, or music with her children, she volunteers her time as able with the Palliative Care Volunteer program and Soup’s On as a kitchen assistant. Joys in life include spending time with her family, traveling, reading, gardening, and cooking. She and her husband have 3 sons, 1 daughter, 2 daughters-in-law, and 3 amazing grandchildren. Being involved with The Chrysalis Fund is a great way of giving back to a community that has been a wonderful place to raise a family. Steinbach has been home to Sherril and her husband Wes for 27 years, a wonderful place to raise their now 3 adult daughters. She enjoys her volunteer involvements with Soup’s On as a board member and weekly cook, as well as with Ten Thousand Villages. Being involved with South East Helping Hands teaching cooking classes also provides an opportunity to give back to the community. Sherril counts it a privilege to be a part of The Chrysalis Fund from its beginning. Her interests include reading, biking, traveling, spending time at the lake and meeting new people. Pat grew up in Morden, MB. She took her Registered Nursing at the Misericordia Hospital in Winnipeg. She has worked as a Nurse in Long Term care for the past 30 years. She is now retired and realizes how fortunate she has been to have realized and fulfilled her passion in working with seniors. Her hobbies include spending time with her grandchildren, following their many activities, spending time in her garden, reading and practicing Yoga. She and her husband Bob have lived in Steinbach for the last 38 years. They have 2 daughters, 2 sons-in-laws and 5 grandchildren. She is honoured to be part of The Chrysalis Fund as it exemplifies building a better community. A giving circle has been described as “a form of participatory philanthropy where groups of individuals donate their own money or time to a pooled fund, decide together where to give these away to charity or community projects and, in doing so, seek to increase their awareness of and engagement in the issues covered by the charity or community project”. The Chrysalis Fund is a women’s giving circle that offers women the opportunity to team together to create a powerful force to work for change in the Steinbach community and area. Women with varying levels of experience in philanthropy collaborate on giving back to their community. By being a part of a giving circle a small individual effort is multiplied to affect significant change. The Chrysalis Fund meets annually to review grant applications and to celebrate the impact that the grants have made. At the Annual General Meeting, members learn about new granting opportunities to registered charitable organizations that promote growth and positive change in youth and children. There is also a segment of the AGM reserved to receive feedback from the organizations that were funded the previous year. When possible, members also have the opportunity to conduct site visits to organizations that were awarded grants. All other communication is conducted via email. The Advisory Board forwards approved grant applications to the members of The Chrysalis Fund. The members’ then review these grant applications prior to the AGM. Members are given an opportunity to cast one vote for the organization of their choice. Although participation at the AGM is encouraged, members are not required to be present at the AGM and may submit their vote via email. The Chrysalis Fund is very grateful for the assistance of The Winnipeg Foundation for their first five years. Their matching grant process allowed The Chrysalis Fund to immediately start with a meaningful grant to organizations in the community while allowing time for capital to grow. Currently, The Chrysalis Fund operates independently to provide community grants, but continues to benefit from a partnership with TWF that manages all investments for The Chrysalis Fund. © Chrysalis Fund 2019. Site by Print Studio One | Three-Six North Marketing.